Although I have more than a couple of books in my to-be-read queue written by Gigi Pandian, I haven’t read a lot of works by this author yet. But given how much I enjoyed this particular book, I will be eager to another “Jaya Jones Treasure Hunt Mystery” as well as other works by Ms. Pandian. Jaya Jones is an Indiana Jones type of person. She’s a historian who actively goes out and researches. But she gets caught up in a murder mystery along the way. Here Jaya gets a manuscript that suggests a link between Michelangelo and Italy’s Park of Monsters. The connection is too much for a historian like Jaya to ignore and she begins to investigate. But a ghost haunts the park and murder makes the stakes very high. Jaya is on the path to more than just a cultural and artistic revelation. Author Pandian has clearly done some tremendous research and brings to life the unusual Park of Monsters (a location I’ve long wished to visit). She writes intelligently and creates unique and very real characters. Jaya, particularly, is a character I want to read more about (and fortunately, I can, since there are three previous books in the series). Everything about this is appealing to me – from the topic of tracking down art, to the location (Italy’s Park of Monsters), to the characters, to the mystery itself. Pandian really weaves a wonderful tale. Two little moments keep me from giving it a full five stars (and I don’t want to give too much away) but the fact that Jaya manages to lose a shoe/boot while running and is not aware of it until after strikes me as slightly convenient for the story but quite authentic (but perhaps it’s simply that I can’t imagine not knowing when I’m running without a shoe on my foot). The other is a little more integral to the plot. The idea that machinery … MACHINERY … has remained hidden for centuries, despite people looking for it, requires some willing suspension of disbelief. Surely there is machinery that has remained hidden for centuries, but usually it’s a case where no one knew about it and no one was looking for it. Something this specific, within a rather specific area, definitely required some willingness on my part to accept, but the rest of the story and the writing makes it worth it. Looking for a good book? 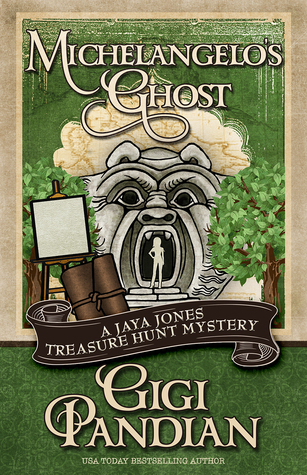 Gigi Pandian’s Michelangelo’s Ghost is the fourth book in the Jaya Jones Treasure Hunt Mystery series and is well worth the read and will likely have you wanting to read all the books in the series (if you haven’t already).